After a long trip through Thailand, Cambodia or Indonesia, arriving in Singapore can really shock your wallet when prices seem too similar to those back home. FELICIA WONG, Matador’s Singapore Expert, shares 9 things to see or do for near-to-nothing in the sunny city-state. Sixty-four hectares of lush greenery, the Singapore Botanic Garden is a tranquil oasis of calm in the midst of the city. Pack a picnic from the supermarket and lounge around on the grass for a lazy afternoon. Entertain yourself by watching the squirrels frolic or observe local couples having their wedding pictures taken (and trying to look romantic despite sweating in their wedding finery). GETTING THERE: Closest MRT (subway) station is Orchard, followed by a short bus ride. It’s close to the British and American embassies, and cab drivers all know it. Often referred to as “bugs’ eyes” or “the durian” (a stinky spiky fruit), the Esplanade has much to offer to visitors. Check listings online or drop by to find out about free events. Weekends often bring free live performances on the waterfront promenade. Best kept secret: The library@esplanade on the third floor is a slick arts library with a wide range of movies, musical scores, CDs, and magazines. Foreigners cannot check items out, but they can browse. Find yourself a seat overlooking the sea to enjoy the view, safe from the humidity. The facility (like almost all of downtown Singapore) is WiFi-enabled. For cheap and tasty local grub (the fancy restaurants in the Esplanade building are anything but), head for the open air local food centre beside the Esplanade building, across from the Marina Square Mall (with giant staircase). GETTING THERE: Closest MRT is City Hall (walk through the subterranean mall) or Raffles Place (across from the Fullerton Hotel). It’s weird, it’s touristy, but oh what fun to snap pictures of OTHER tourists snapping pictures with the half-fish, half-lion creature created by the Singapore Tourism Board in the 1970s as a tourism symbol (don’t ask). Be amused by the bus loads of Asian tourists excitedly striking poses with the watery beast. 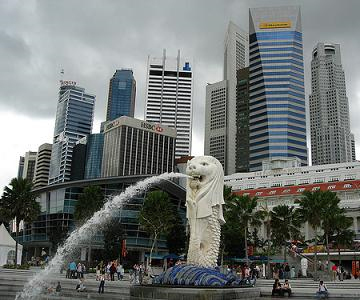 You can easily visit the Merlion by walking across the bridge from the Esplanade theatres. GETTING THERE: Closest MRT station is Raffles Place, or stroll from City Hall, and pass the Esplanade Theatres. Singapore’s museums often do not charge entry fees for permanent displays, requiring payment only for special exhibits or features. On Fridays after 6 PM, the museums allow free entry for all, and may even include free guided tours. Check the National Heritage Board’s website for information on opening hours, exhibits, and other details. The newly-refurbished National Museum holds open-air Friday night movie screenings every so often on its front lawn. The movie nights are often themed (they have held the ‘Audrey Hepburn’, ‘Retro’ and ‘Asian Horror’ series so far), and make for great fun and a free night out. Check the museum’s website for information, but be sure to get to the lawn early to secure a good spot! GETTING THERE: Closest MRT station is Dhoby Ghaut station, or also walkable from City Hall. 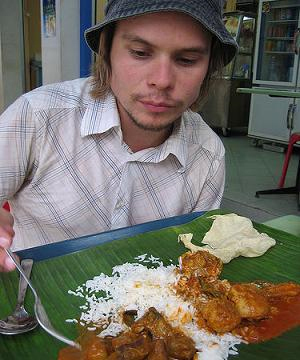 Little India is chaotic and it’s not eat-off-the-floor clean like the rest of Singapore, but it certainly has character. Stroll around the narrow streets overflowing with stalls blasting Bollywood tunes, get a henna tattoo, or enjoy cheap, tasty and authentic Indian food at the numerous food stalls. For extra fun, visit the massive Mustafa Shopping Centre, Singapore’s only 24 hour shopping mall. The quirky mall sells everything from groceries to clothing to electronics to toilet bowls, and even cars. It’s quite the experience for free, if you manage not to be enticed into buying something you never knew you needed. GETTING THERE: Closest MRT station is Little India. Little India and Chinatown are home to many Hindu and Buddhist temples, which you can visit for free. The temples are usually abuzz with activities at every hour of the day, so you can observe devotees of the respective faiths going about their religious rites. Of course, be respectful when taking photographs and abide by customs such as removing your shoes or being dressed appropriately. East Coast Park, Singapore’s largest– stretching 15 km along the coast– gets you out of downtown Singapore and is a great place to get some exercise (besides power-walking through malls, of course). Rent bicycles, in-line skates, or even go windsurfing or canoeing. Camping is also possible if you can beat the heat (permits not required for 3 nights or fewer), and there are public bathrooms with cold showers available every 500m or so. The McDonald’s here features the world’s very first “skate through,” where there’s a special line for in-line skaters. *Singapore’s other parks in the suburbs also have bicycle and in-line skate rentals. Check the National Parks website for information. GETTING THERE: Take bus 36 from downtown or the airport and alight around Marine Drive. You will need to ask for directions to find the underpass that takes you beneath the freeway and to the park. A cab from downtown could set you back S$18 or so. Check here for directions. 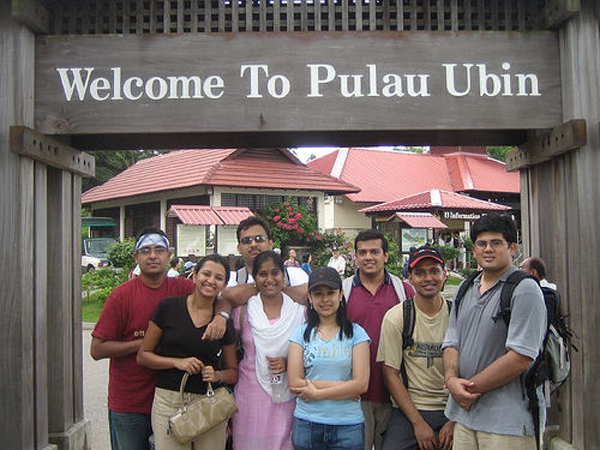 One of the last surviving “rural” areas of Singapore, Pulau Ubin is an island about 10 minutes off the eastern coast of mainland Singapore. The tiny (and dwindling) community tries hard to hold onto its rustic way of life and still has chickens and ducks waddling around. The best way to explore the island is to rent a bicycle. Visit the mangrove swamps and Chek Jawa beach, home to Singapore’s native flora and fauna. There’s also a disused granite quarry and a shrimp farm on the island. GETTING THERE: Take the MRT to Tampines MRT station and transfer to bus 19 to get to Changi Village jetty. Boats from the Changi Village Jetty leave when there are 12 passengers (S$2/pax), or you can pay the difference to leave immediately. Community Connection: Matador member Mal visited Singapore recently and wrote about the trip over in the Community blog. Have you been to Singapore? Share your experiences in a comment below, or set up your free profile today on Matador!